GIFT FOR THE COLLECTOR AT HEART! The Jeweled Ocean by Richard Ellis. DSCRIPTION: See Pictures for Details, they're the actual item, not stock photos. 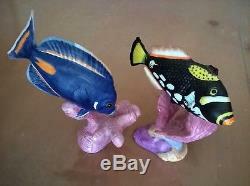 This beautiful tropical marine fish porcelain collection was designed by renowned marine artist Richard Ellis. "The Jeweled Ocean" collection contains 15 porcelain sculptures. With each set of pictures taken, you'll see, I took the back and front views of the fishes. I only found two fishes with issues (SEE pic# 10,11 that show the back and front of them). 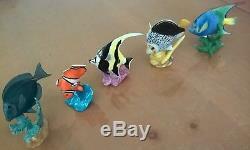 It had few clips which I glued back on and both have missing pieces to their fins. Youre still getting a great discount, as to maybe replacing them separately later on, the rest of the fishes, show a brilliance to color and didn't notice any chips or scratches. 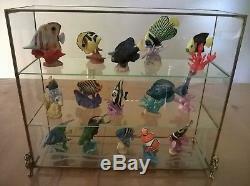 This was a hard decision for me to do and based on having only ONE COA (Certificate of Authenticity) that comes in a box with a booklet description for each fish. The collections were created under the hallmark of The Franklin. 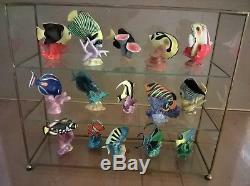 The sculptures in this series are approximately 3 to 4 inches tall. PLEASE NOTE: BRASS GLASS DISPLAY CASE IS. They are no longer being made or available from The Franklin Mint, making this more of a RARE collection to have. 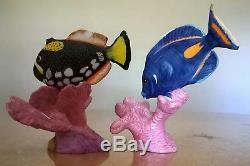 The sculptures come with a box that includes COA and little fact booklets for each fish. The COA states: This is to certify that The Jeweled Ocean is a collection of 15 sculptures, each an original work of art by Richard Ellis, handcrafted in fine porcelain and painted by hand. It is further certified that this is the artist's premier sculpture collection and that it is available exclusively from The Franklin Mint. We provide a description of items based on observation, our research or provided information and try to answer all questions to the best of our ability. We try to be fair and conscientious with our descriptions and condition, however, potential buyers should note preowned items often show normal signs of use and wear, not always specified. Additionally, lack of a condition report does not imply that it's in perfect condition or completely free from wear and tear, imperfections, or the effects of aging. FRANKLIN MINT The Jeweled Ocean, 1988. No chips, cracks, breaks (on only two fishes, SEE PICS). ABOUT RICHARD ELLIS: Born April 2, 1938. Richard Ellis is an American marine biologist conservationist, author, and illustrator. He is a research associate in the American Museum of Natural History's division of paleontology, special adviser to the American Cetacean Society, and a member of the Explorers Club. Ellis is the author of more than eighty magazine articles, which have appeared in such journals as Geo, Audubon, Natural History, Animal Kingdom, Curator, Smithsonian, Science Digest, and National Geographic. He has been the subject of cover stories in American Artist, Ocean Realm, Yale's Discovery magazine, and his alumni magazine, the Pennsylvania Gazette. He has appeared in numerous television. And has written screenplays on whales for PBS. As an author of more than a dozen books, including The Book of Whales, Monsters of the Sea, Book of Sharks, Imagining Atlantis, The Search for the Giant Squid, Aquagenesis, and The Empty Ocean. Hes also a celebrated marine artist whose paintings and drawings of marine life have been exhibited in museums and galleries around the world. When interviewed an asked what else should we know about you? He answered, I've written 27 books, almost all about marine life. The one exception was Tiger Bone and Rhino Horn, about the destruction of wildlife for Traditional Chinese Medicine. I've tried to communicate the wonders of the marine. So that readers will understand how marvelous it is, and why they should not be killing all these creatures. 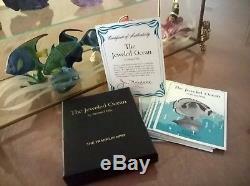 The item "The Jeweled Ocean Porcelain Fish Collection by Richard Ellis (Franklin Mint)" is in sale since Wednesday, October 3, 2018. This item is in the category "Collectibles\Decorative Collectibles\Decorative Collectible Brands\Franklin Mint\Figurines". 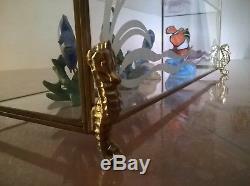 The seller is "iguara" and is located in Casselberry, Florida. This item can be shipped to United States.